o Make the concise ones into bookmarks, laminate them, let people choose in return for a donation. • As part of your publicity – choose pithy arresting ones to catch the interest! • As part of a discussion activity - give one to everyone or, if people are sitting round a table, let people choose one they like. Invite them to share it with the others and initiate a discussion about what gives them hope for a more equal and peaceful world. You could use this together with the Pledges. • As part of an interfaith event – invite people of various faiths to share their faiths’ teaching about theme and bring quotations. You can offer these as a starting point or to add to the faiths represented at your event. 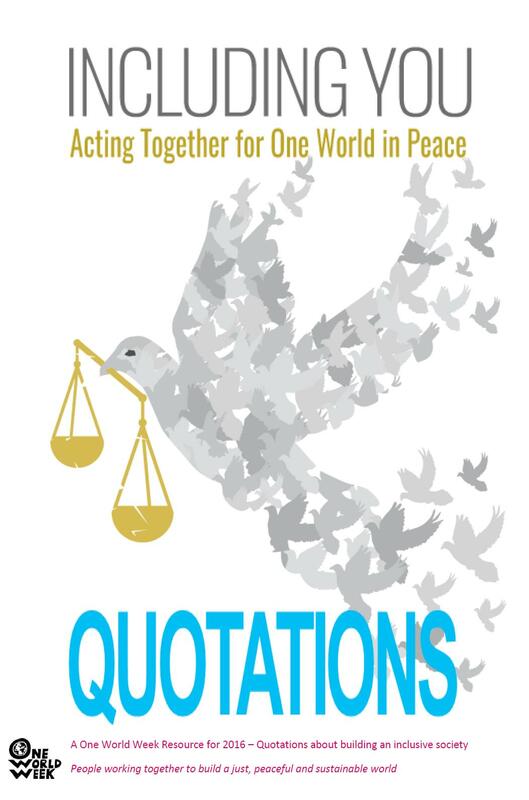 • Your ideas – we would love you to share your ideas about how to use quotations with other OWW organisers. Contact us and we’ll put them on the website. We found the following quotations from various sources, as indicated, - from websites, publications and reports. You will probably know lots more. Please tell us about your favourites – with sources if possible and we’ll include some of them on the website or use them to update this list.